This album is the centerpiece of a project, two years in the works, which is an adaptation of the Absurdist stage play that gave the band its name - Alfred Jarry's "Ubu Roi" (King Ubu). The songs are the backbone of a theatrical production, "Bring Me The Head Of Ubu Roi", which premiered in 2008 over two days at London's prestigious Queen Elizabeth Hall. A Radio Play was recorded as an audio storyboard for a proposed film by The Brothers Quay, who created animations for the theatrical production. "Ubu Roi" premiered in Paris in 1896 provoking riots in the theatre and a national scandal. It was banned after only two performances. The story was a re-telling of Shakespeare's "Macbeth" and is a vicious satire of the bloated and corrupt state of pre-World War I Europe. 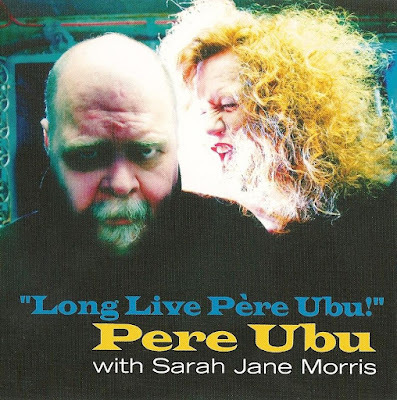 "Brutal, lacking charm, and without redeeming values, this is an album for our times," Pere Ubu founder David Thomas says. "It is, in fact, the only punk record that's been made in the last 30 years." "Long Live Père Ubu!" is not background music. It's not "fun" music. It's an intellectual and conceptual challenge and as viciously satirical as Jarry's original. "If you're not going to listen to this with the same effort you'd devote to a literary novel, you're wasting your time," Thomas says. "It's long past time for rock music to grow up and move past the simpering platitudes or Tom Joad cant that passes for serious thought. All hail the survival of the Unfit!" Every moment of the sound has been carefully crafted as a narrative voice in its own right according to Thomas' hyper-naturalistic™ recording methods. For more than a decade, working in partnership with engineer Paul Hamann, Thomas has accumulated an array of "junk-o-phones" to replace studio microphones. These include speakers salvaged from broken devices, wooden boxes, metal horns, panes of glass, even doors, wired into specialized electronics, likewise salvaged from castaways. David Thomas, of course, is the voice of Père Ubu. Sarah Jane Morris (Communards, Happy End) was recruited to sing the role of Mère Ubu. Pere Ubu's soundman, Gagarin, an ambient electronica recording artist in his own right, guests on the album and joins the band on stage. The rest of the band, unchanged from the last studio album, Why I Hate Women, sing other roles. They are Keith Moliné on guitar; Robert Wheeler on EML synthesizer, theremin; Michele Temple on bass; and Steve Mehlman on drums. "Long Live Père Ubu!" and selected out-takes are available as a digital download from Pere Ubu's own online "store" - hearpen.com, which is operated in partnership with Smog Veil. The cd is a Hearpen Records release (HR149) in the USA. Cooking Vinyl has simultaneously released it in the Rest Of The World.